From our cows to your cup, we follow many strict government regulations—including pasteurization—to ensure that Hiland Dairy Milk is safe to drink. Over the past decades and centuries, as farmers learned to make more food with fewer resources, most of us have shifted from living on farms or in rural settings to cities. While the nation’s industrial revolution and technological advances helped grow our country and citizens gained work and expertise in other professions, it also meant that most of us became further and further removed from farming. So, it’s only natural to wonder where our food comes from and how it was produced. Terms like “pasteurization” may be unfamiliar to some, and there are even a few who question its purpose. About 150 years ago, Louis Pasteur developed the pasteurization process while he was tasked with finding practical solutions for problems such as keeping harmful bacteria at bay in different foods. A few decades after he first came up with the process, a New Jersey milk plant installed the first pasteurizer in the United States. Since that time and through today, with the exception of milk that’s marketed as “raw” milk (milk that has not been pasteurized), all milk in the United States has been pasteurized. This process is one of the many ways the U.S. dairy industry helps ensure that your milk is safe. In most milk processing plants, chilled raw milk is heated by passing it between heated stainless steel plates until it reaches 161° F. It’s then held at that temperature for at least 15 seconds before it’s quickly cooled back to its original temperature of 39° F. Here’s the “cool” part: One way the dairy industry saves energy involves using the heat of the heated pasteurized milk to warm the next batch of cold raw milk. Cold milk is then used to cool the heated pasteurized milk. By doing this, the industry uses heating and refrigeration energy more efficiently. No. 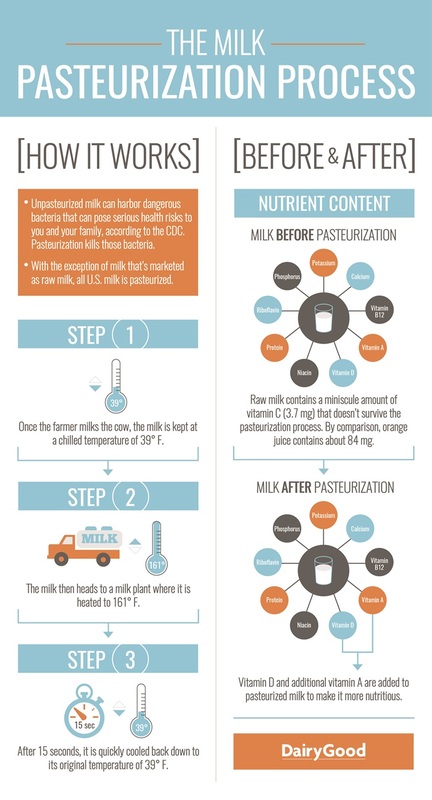 According to the CDC, pasteurization does not significantly change the nutritional value of milk. In fact, you can get all of the nutritional benefits of drinking pasteurized milk without the risk of illness that comes with drinking raw milk. When it comes to milk’s nutrients, all of milk’s minerals stay the same, but there is one small change when it comes to the vitamins. Raw milk contains a minuscule amount (<10 percent of the Recommended Daily Allowance, so it’s not considered a good source) of vitamin C, which doesn’t survive the pasteurization process. In addition, according to the CDC, if you’re thinking about drinking raw milk because you believe it’s a good source of beneficial bacteria like probiotics, you need to know that it isn’t. It could be harmful and make you sick. If you’re looking to enjoy a food or beverage with probiotics, experts such as registered dietitians suggest purchasing one that’s actually labelled for containing probiotics, rather than taking your chances. At the end of the day, you can feel confident knowing that Hiland Dairy Milk is not only good for you, but safe, too. From our farms to your grocery store, we in the dairy industry know how important those qualities are and work to make sure your family enjoys the best milk possible. For more answers to your raw milk questions, visit the CDC’s website or the U.S. Food and Drug Administration’s site. And don’t forget to do your part, too, by checking out these simple tips from DairyGood.org to keep your Hiland Dairy Milk as fresh and safe as possible!